Photo courtesy of Chris Katsouleas. What is it about ducks that evokes the “Ahhh” response that pigeons or grackles usually don’t? 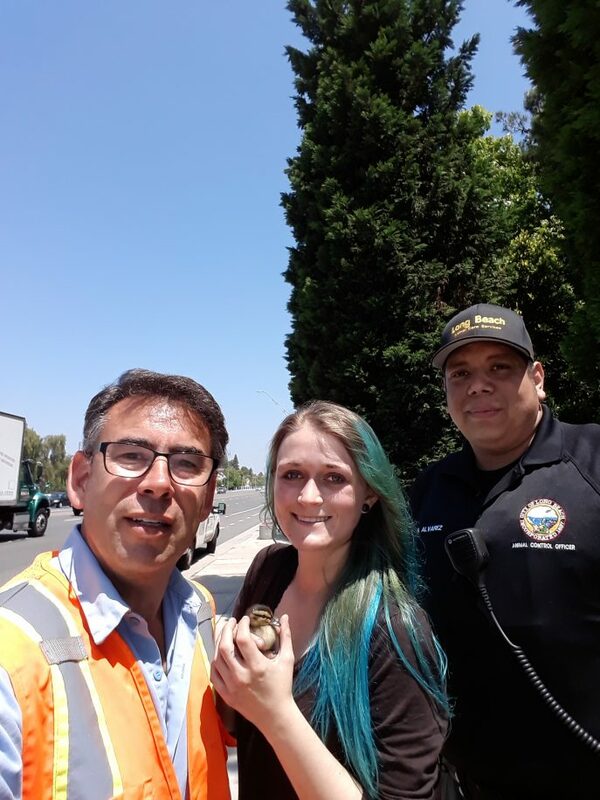 Landon was driving down the Pacific Coast Highway when she spotted a bird rescue in progress near the Gaslamp restaurant on Loynes and the PCH. 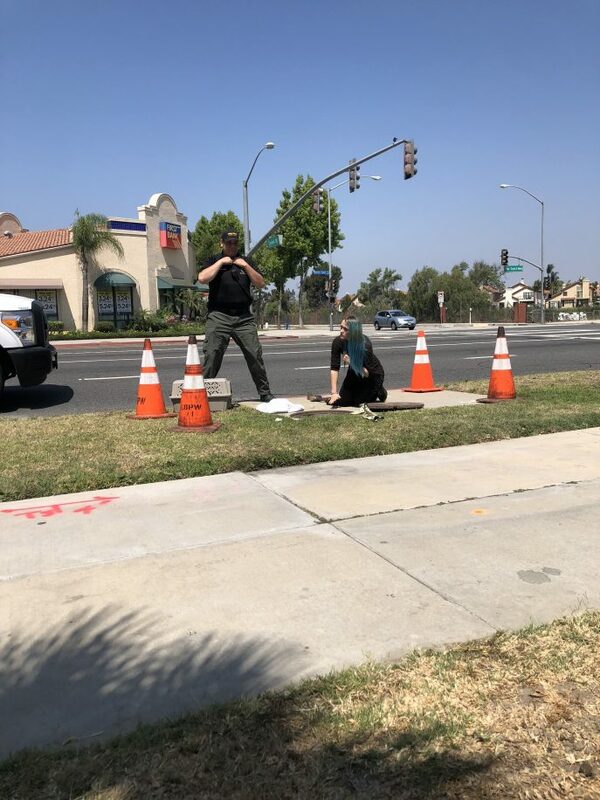 An open manhole cover was flanked by a Long Beach Animal Control Officer, staff from Public Works and a knot of onlookers that included rescuer and animal advocate Markelle Pineda. She quickly parked the car and, temporarily leaving her passenger, who’d been through it before with Pineda, stopped traffic and tried to lead the webfooted family across the street. When she felt that she had it handled, she resumed her errand. On the road to the VA, it occurred to Pineda that the ducks were going across the road for a reason. Feeling that it wasn’t simply to get to the other side—ducks aren’t chickens—she dropped her father’s friend off and returned. Parking at the Gaslamp, she found the mother duck had returned to the wrong side of the road, daffy with distress. Again, she escorted the little family safely across the street to the Bixby Village Golf Course. She returned, looked down the storm drain, and spotted the duckling. She called Public Works and spent the next hour talking to the little bird. 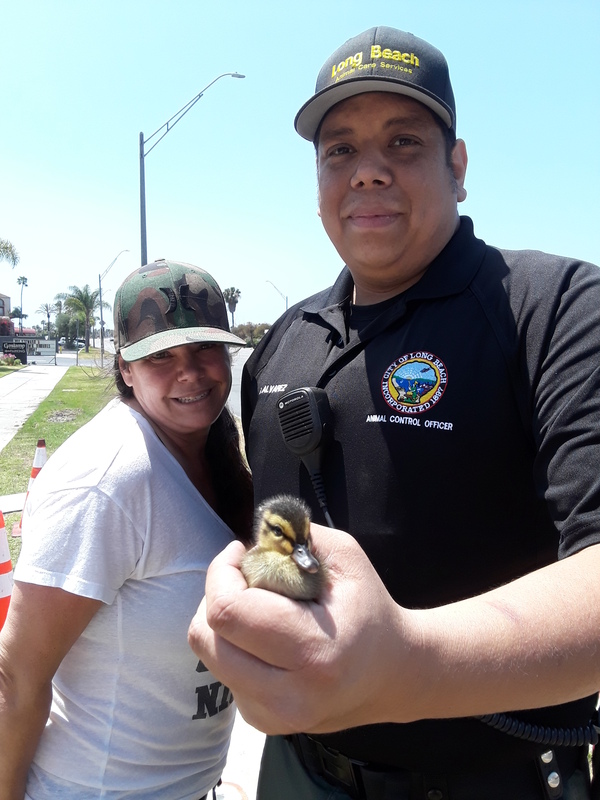 Public Works equipment operator Chris Katsouleas, who is assigned to assigned to the Public Works/Street Maintenance Division’s Emergency Response Task, such as for ducks down a drain, got to the Gaslamp as soon as he could get away. This wasn’t Katsouleas’ first barn dance. 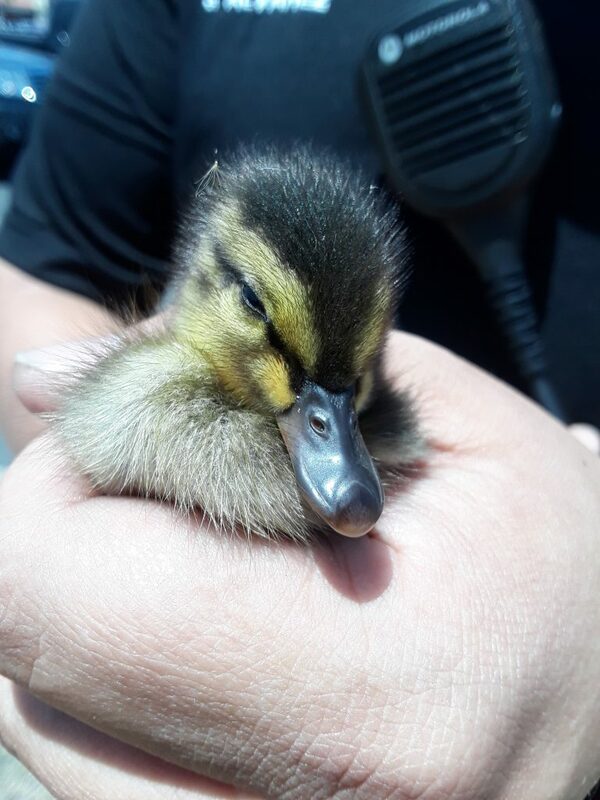 He performed his first storm-drain rescue several years ago when he pulled some ducklings out of a pump station. 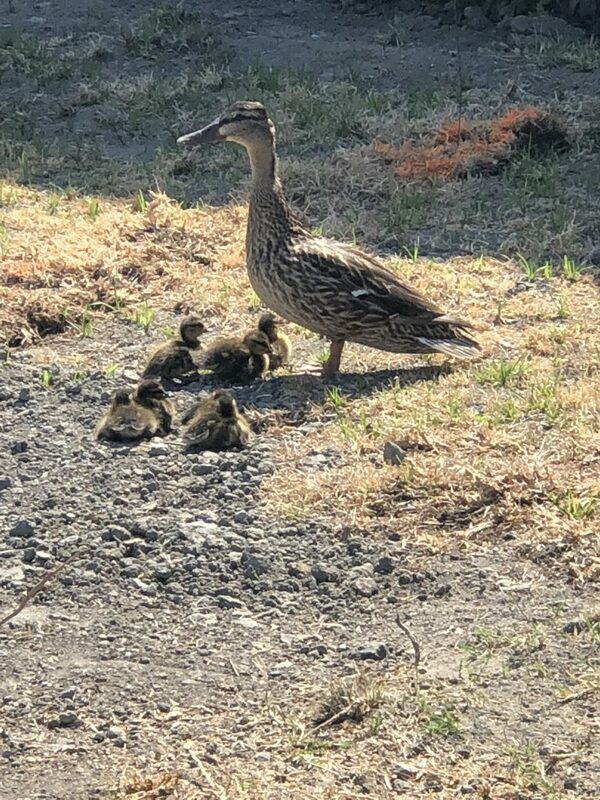 Public Works Bureau Manager Arthur Cox described how Katsouleas downloaded mother-duck calls to his phone and coaxed the critters to move toward him. Katsouleas had also built a cat ladder out of odds and ends to rescue a very tired feline who got stuck in another storm drain. During the last rainy period, Katsouleas and a few people from the shelter and rescue community staunchly pulled off a days-long marathon mission of pulling kittens from yet another storm drain. 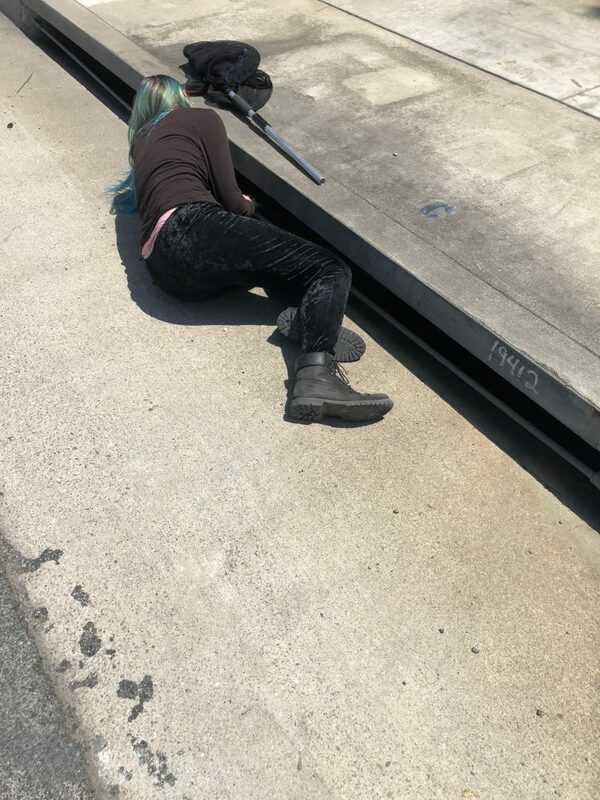 Animal Control Officer Gabriel Alvarez was already at the storm drain near the Gaslamp with a visibly nervous Pineda when Katsoulas got there. Mama Duck was hanging out across the street at the golf course, watching the activity; then, apparently deciding that rescue efforts were under control, went fishing in the little lake there. Katsouleas and Alvarez determined the location of the duckling by listening for its chirping. Alvarez (left) and Katsoulas open manhole cover and cone off the entrance to find out where the duckling wound up. Photos courtesy of Markelle Pineda. 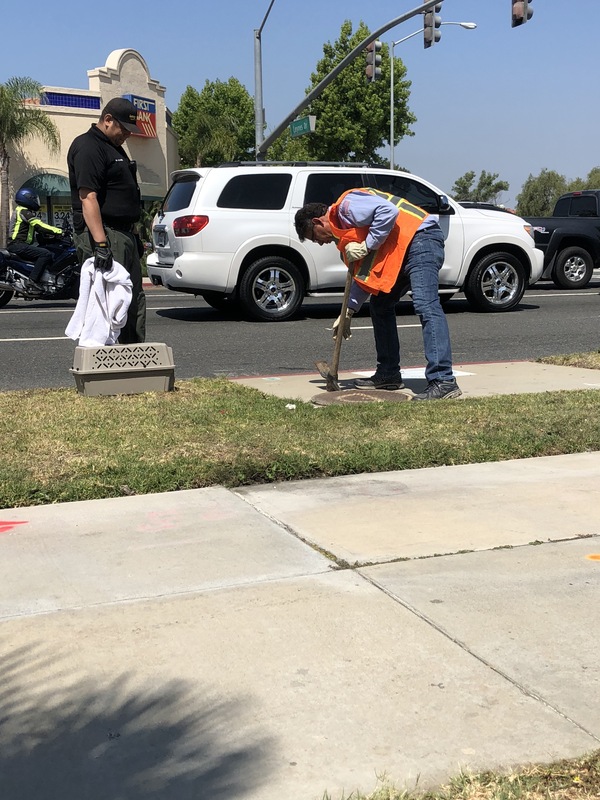 “Normally, we open the manhole cover and try to determine where animal’s at, and then we try to figure out if it’s coming in this direction or away,” Katsouleas said. “Gabriel and I both discussed things as we were going along.” They ruled out the net at that stage because the duckling seemed to be startled, so they downloaded their mama-duck calls. Instantly, the duckling stopped peeping, so they instantly shut the speakers off. Then, fate intervened with the arrival of Landon. Along with her studies at LBCC, Landon leads ecological tours for children at the Bolsa Chica Wetlands and does cleanup there. She also volunteers at the Wetlands and Wildlife Care Center in Huntington Beach https://www.wwccoc.org/, so she was a welcome and necessary addition to the flock. “She informed us of what her background was, and she was more knowledgeable than we were,” Katsouleas said. “I saw the situation and said, all right, show time,” Landon said. “I carry around a 30-pound bag of birdseed—I love birds.” Landon’s favorite feathered creature is the rock dove, aka the common pigeon. Landon jumped out of her car, seed in hand, and looked down the drainpipe. She spotted the duckling and tried to lure her out with the birdseed, with no success. Meanwhile, the chirps were getting fainter and fainter, and it seemed that the little duck had gone through the tunnels across the street. Mayday for duckling: Landon looks down the drain in order to locate the errant quacker. Photo courtesy of Markelle Pineda. By this time, of course, the Fire Department had joined in, and Katsouleas and Alvarez walked over to get some help from them. When they got back, Landon had the little duck in her hand. They were astonished. Katsouleas and Alvarez aren’t quite sure how Landon managed the rescue, but they did attribute it to her persistence and agility. The duckling had a happy reunion with her family, and they all went wibble-wobbling off, to and fro. Photo courtesy of Markelle Pineda. The Just Ducky Dream Team. Photo 1, from left: Chris Katsouleas, Lexi Landon, Gabriel Alvarez. Photo 2, from left: Markelle Pineda, Alvarez. Center: One lucky duck.